You guys are amazing! Every last one of you has inspired me and challenged me to grow as an artist and expand my horizons. Here's to finding ourselves and losing ourselves more and more this week and in the coming new year! Cheers! I just love your lettering, the white outline makes it pop and the page is so cool. Happy PPF! That's exactly what I wanted the white outline to do! So glad it worked! What a fabulous quote! Love all the painty drips behind your great lettering! Happy PPF! That's it Janice, you've got it so right, it keeps us all so sane and balanced, well it's a real need for me, even if just a little doodling time, so relaxing! So cheers to you too, I love all your creations! I've really been doodling a lot lately, Kat. It is so very centering. I'm glad it does that for you, too. I am visiting from Creative Every Day. So glad to be here! Yes! Julie, you will LOVE Paint Party Friday! There are some amazing artists there and they are soooo encouraging and supportive! 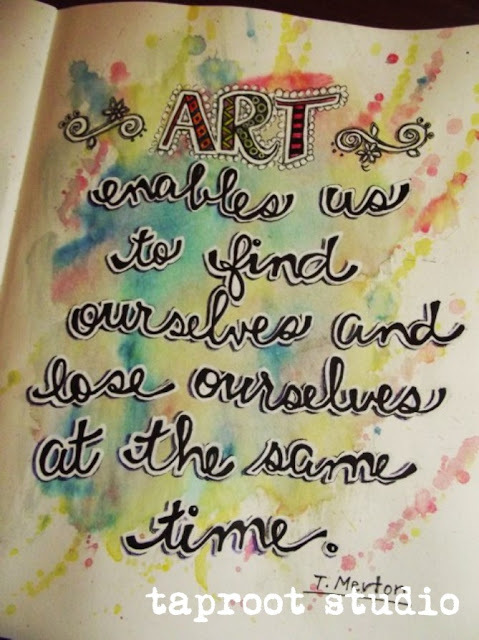 Wonderful painting, I love the quote you used and how you illustrated it! Thank you, Stephanie, and thank you for stopping by. Enjoy your weekend! Wonderful quote and colorful creation ~ Wow! Great quote and what a lovely way to display it! Happy PPF! Thank you, Linda. 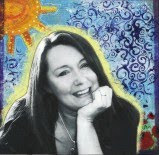 I just read on your blog about the Creative Abundance course you're taking. It sounds wonderful. I absolutely love this quote...and love what you did with it in your art! Thank you so much, Mary! You made my day! Thanks, Netty. I need to pop over to your blog to see what you've been up to this week! Great job! I have a hard time challenging myself sometimes but when I do, I grow. Happy PPF! It gets even more interesting when you start posting your response to those challenges for everyone to see, don't you think? That's really helping me to grow as well. Awesome piece, love the hand lettering and it totally mystifies me how you got it on the beautiful watercolor dribbles background! :) Great colors, great job! Thank you, Anne. It's so great of you to stop by and leave a bit of encouragement. Thank you! Love the quote and I agree. I have been so inspired by all the artists out there in blogland. I'm glad I finally took the trip!! Love your lettering. It's so funny how I had it in the back of mind that I had to reach some imaginary level before I should share my work here but since I took the plunge I find myself growing so much faster. Thank you for stopping by, Gina. Lovely calligraphy! I like the combination of the stark black and white with the soft watercolours. Thanks, Sandra. I hope you have a very Merry Christmas! Wonderful quote, and really like the lettering style. Thanks, Nigel. It's nice to hear from you. I hope you're having a "flutterless" holiday season. Beautiful quote and the lettering is fabulous. Love the free drips behind. Happy belated PPF!